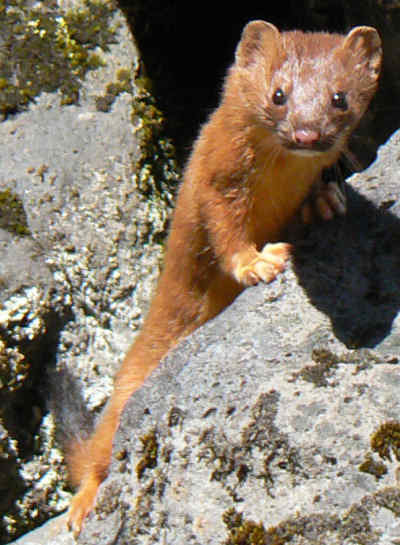 The long tailed weasel is a cute looking species of mustelid that are abundantly found in America and southern Canada. However, their appearance is quite deceptive when it comes to the fact that they are deadly carnivorous hunters in the wild and a massive threat for mice and voles. These mammals make an interesting study mainly because of their hunting pattern and fearless attitude in attacking bigger animals. It is equally interesting to observe them secure extra stock of prey for future usage, simply driven by their basic instincts. Long tailed weasels are considered to be one of the largest species belonging to the genus Mustela in North America. It has been noted that females are usually 10 to 15 percent smaller than the males. This animal has a small head with a very cute face and long whiskers. Its body and neck are long and slender while the legs are short. Long tailed weasels molt twice each year. Molting is largely caused by changes in photoperiod; this process lasts for almost 30 days. 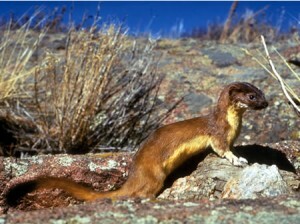 Size: The male long tailed weasel is approximately 35 – 45 centimeters long from its nose to the tail. Females, being slightly smaller are about 27-36 centimeters long. It is noteworthy that the tail of these animals makes up for almost 40 – 70 percent of the total head and body length. Color: The dorsal fur on the upper side of the weasel’s body appears brown during summers. While the fur covering ventral portion of its body is white or buff in color. The weasel’s tail has a distinct black tip. 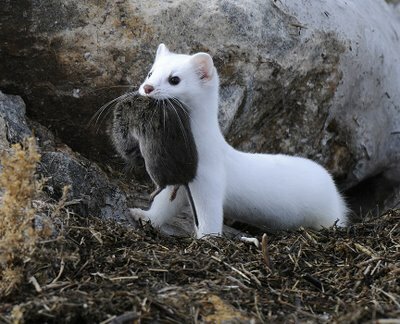 In the winter season of northern areas the long tailed weasel’s fur becomes white; sometimes a few yellow tints can also be observed. However, even in this phase its tail tends to retain the black tip. Weight: On an average, the males weigh about 225 grams; while females are around 102 grams in weight. Eyes: The color of the eyes is black during the daytime. However at night the eyes of this animal glow bright emerald green if caught in a spotlight. Tail: As the name suggests this species have a long tail with a black tip. Soles: Its soles are naked without fur in the summer time. A total number of 42 subspecies of the long tailed weasel have been recognized till date. The long tailed weasel is a deadly and aggressive hunter with a voracious carnivorous diet. Moreover the long and slender body structure of this animal easily allows it to slip into rodent burrows and tunnels in search of prey. It is not unusual for these weasels to burrow under deep snow in order to hunt its prey. These veteran hunters track their prey by scent and sound. Long tailed weasels are fearless animals that do not hesitate to attack animals that may be much larger than them. It smashes the prey’s skull with its sharp canines and laps out the blood instead of sucking it. Their diet chiefly comprises of mice, rats, chipmunks, squirrels, moles, shrews, gophers, moles and rabbits. At times it also feeds on small ground birds, bird eggs, snakes, frogs, earthworms and even insects. It may also resort to taking bats from nursery colonies but, that again is a rare scenario. These animals inhabit most of the United States with the exception of south eastern California, Nevada and Arizona. Its distribution further extends to southern Canada, Mexico and South America. 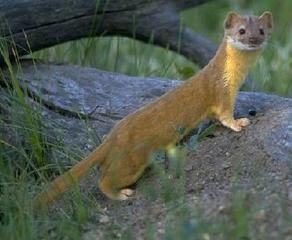 Long tailed weasels are mostly found in open forests, shrub, crop fields, farmland and grasslands. They usually prefer to dwell near a water source likes streams and lakes. The males are polygamous in nature, usually having more than one mate at a time. It is likely for them to enlarge their territory prior to the mating season to make room for neighboring females. The mating season lasts from July to August. It is typical for the males as well as females to fight and struggle before mating. The act of copulation can be lengthy and is known to occur repeatedly for many days. Implantation of the fertilized egg is process that tends to get delayed until March. The gestation period continues for 10 months. It has been found that the actual development of the embryo takes place during the last 30 days of the entire gestation period. The litters are born in April – May. There are about 5 – 8 kits in each litter. Newborn kits are partly naked without fur and cannot see. However, they tend to grow quite fast acquiring a full coat of hair in less than 3 weeks. By this time they are also able to crawl out of their nests and feed on meat. The kits’ eyes open after a period of 5 weeks and they are physically active and vocal. By this stage weaning begins whereby the kids accompany their mother in hunting trips. The young weasels are independent in around 3 months. The females become sexually mature at 3 – 4 months of age; while, it takes 15 – 18 months for the males. Long tailed weasels are considered to be solitary animals with the exception of the mating season. It usually dens in rotting logs or beneath tree roots or rock piles. Long tailed weasels also prefer to dwell in abandoned burrows and chipmunk holes, instead of digging its burrow. It nest is roughly around 22-30 centimeters in diameter and is made of grass and leaves with a fur lining (extracted from its prey). Long tailed weasels are excellent tree climbers; they can also swim. They are mostly active during the night. Its vocalization may include sounds resembling squeals, trills and squeaks. These animals are known to release a strong smelling musk if they are frightened or during the mating season. Long tailed weasels have an average lifespan of approximately 5 years. During winters, the long tailed weasels home to the northern areas turn white except for the black tail tip. This is an excellent adaptation of these animals that protects it from its predator (like owls and hawks) by providing a camouflage against the snow. Let us take a look at some really interesting facts about the long tailed weasel. This species are known to have evolved in North America almost 2 million years ago! The stoat is considered to be a replica of the long tailed weasel, except the former is slightly smaller in size. The high metabolic rate of long tailed weasels allows them to eat about 40 percent of its body weight every single day! Did you know that long tailed weasel is also known as bridled weasel or big stoat? Long tailed weasels do not hibernate. In some locations long tailed weasels are enlisted as endangered species; while they are considered as species of concern in others. Take a look at these pictures of the long tailed weasel. We discovered we have a long tailed weasel on our property. I hope he stays around .Because we have a squirrel problem .Isn’t it wonderful to watch mother nature at work…. I trapped these when I was in grade school. The largest one I caught was 24″. I thought that was a pretty good size.